There is an easy, quick, and ecological way to get to Venice: by train. Oftentimes you underestimate this option even if in fact it usually is the most convenient, in particular for those who appreciate to travel across the marvelous peninsula of Italy. For Italian visitors traveling by train is a common mode of transportation, but for those who come from across the border of this Belpaese, going by train is an underestimated option. If you are thinking about crossing Italy and visiting cities like Milan, Rome, and Florence, Naples or Turin, going by train remains the best option (there are mainly two Italian companies: Trenitalia and Italo; book in time to find advantageous prices). If local flights seem too expensive and un-practical (oftentimes low cost airlines use little airports that are out of hand) if transportation by wheels-car or bus– can seem chaotic and complicated (for example where to park your car?) 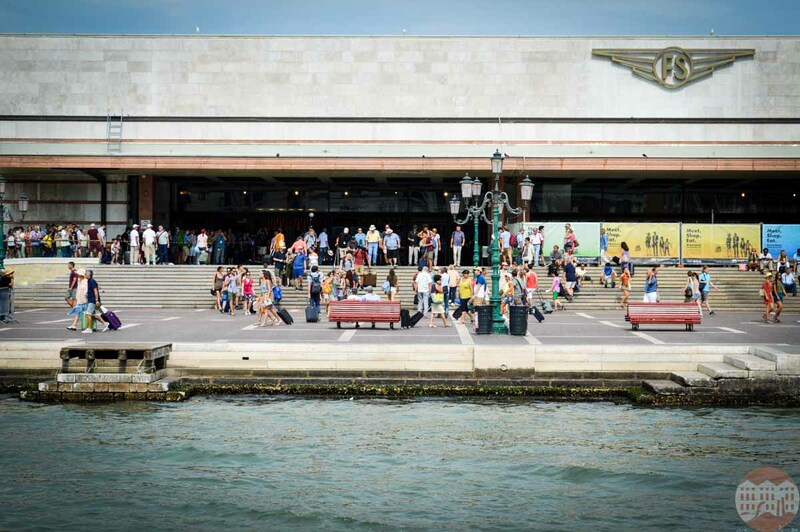 traveling by train will allow you to reach Venice directly without traffic problems, or luggage restrictions, and added connections. Reconstruction on the Santa Lucia Train Station, named after the 1860 church and convent, in the square where the station is located now. The completion of what is more or less seen today, constructed in different phases, was finished sometime after the Second World War. The train station is one of the most frequented places and is a perfect example of rationalized architecture. Even though its style and artistic beauty is different from the rest of the lagoon, as soon as you venture out of Santa Lucia you’ll be immersed in this marvelous island; you’ll find the Grand Canal as soon as you exit the premises as well as the relative water bus stops that will take you to every part of Venice) You can admire the Scalzi Church and its hidden brolo. If you are interested in contemporary architecture- it is a must to cross over the Constitution Bridge that was projected by the Architectural Star Calatrava a Valencia Santiago native. Which is more convenient to get to Rialto stop, by water bus or train from Marco Polo airport as our flight in arriving at 21:30pm. on a friday.